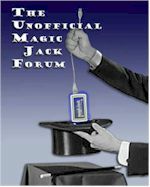 Is YMAX or Magic Jack On The Stock Market? [ Poll ] Flat panel HDTV, LCD or Plasma? [ Poll ] MagicJack Good Enough 4 Your Only Phone? Wondering if anyone here has an 750i sli board? What the Hay is up with this forum????? A newer, much much faster Internet? [ Poll ] What "Personal" Firewall do YOU recommend? Anyone receive any Telemarketing Calls on MJ yet? call forwardign when its down?